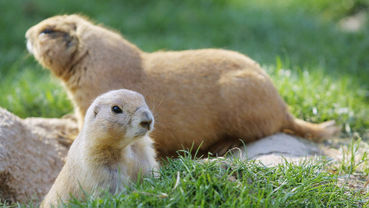 "When people realize that prairie dogs and other animals as well can talk � suddenly they see these animals with a new perspective," he said. "They're actually thinking, breathing things not that much different from us." Very cool....but now we're eavesdropping on hapless animal conversations too??? Was this government funded? Thanks for the interesting article Michael. I hope this scientist used prairie-dog-friendly paint on them....but why not food coloring? Call me nuts but I've had enough cats and dogs to know that if they've been 'painted' with anything, they're gonna lick it off!! So, I'm hoping that the 'paint' he used was degestable and prairie-dog-friendly!! Thnx Michael. ... Prairie-dogs it was, as mentioned (again, methinks) by Derrick Jensen in his upcoming book "Anarchism and the Politics of Violation", where he writes, " Prairie dogs have language, and grammar, and friends. " Noted, Thank you Michael for the article. Love Prarie dogs!